Get creative with these layered frozen ice-cream sundaes made in a mini muffin tin. We started with crushed wafer cookies and then interspersed fudge and chopped peanuts between layers of ice cream, but you can substitute any of your favorite toppings. 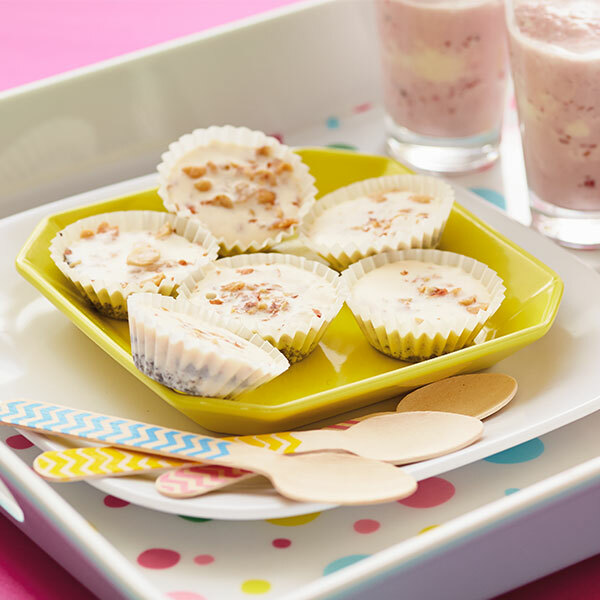 These mini ice-cream sundae bites are just right for kids and the recipe makes 24 servings—perfect for parties or for adding a pop of fun to weeknight meals. Put mini-muffin liners into 2, 12-cup mini-muffin pans. Layer 1 tablespoon ice cream into each muffin tin, on top of the cookie crust. Layer 2 teaspoons fudge sauce over the ice cream layer. Add 1 teaspoon of chopped peanuts over the fudge sauce layer. Add another tablespoon of ice cream on top of the peanuts. This layer will be heaping over the tops of the paper liners. Freeze for at least 40 minutes. Then serve.